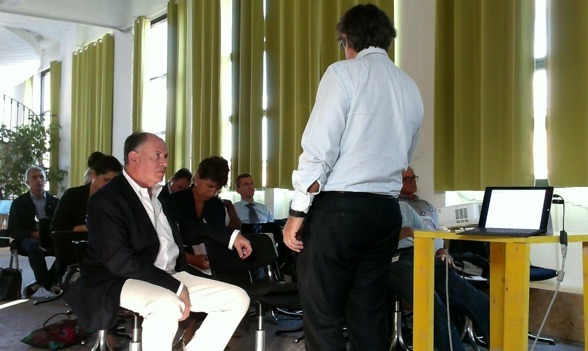 The 2nd Italian Focus Group “Mobility Goes International: USA and Emirates” took place in Torino on the 21st September 2016 and was hosted by Torino Wireless, MobiGoIn’s coordinator. The Focus Group saw the participation of 14 people representing 12 Italian companies and organizations (1 start-up, 8 SMEs, 1 large company and 2 local organizations) interested in the internationalization of their Smart Mobility solutions and applications. Before starting the meeting, all participants met each other by presenting themselves and the reasons why they were attending the workshop. 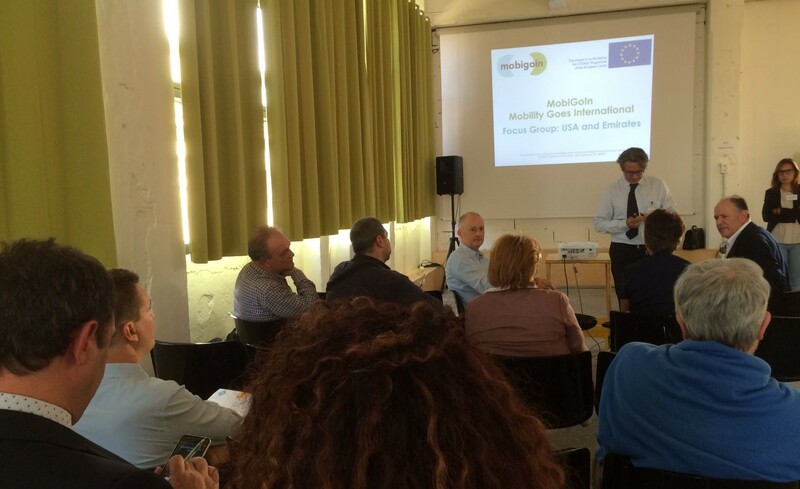 The event began with the presentation of MobiGoIn project: its goals and objectives, the main activities and the internationalization strategy definition process. As it resulted from the first market analysis and inputs about the companies’ market interests, primarily the United States of America (USA) but also the United Arab Emirates (UAE) are well positioned among the preferred business destinations. For this reason, Torino Wireless chose to focus the 2nd Focus Group in insights regarding the approach to USA and UAE markets. Mr Mauro Bandelli, partner of “Gen-USA” and “Gen-Emirates”, was invited as an internationalisation strategies expert for presenting internationalisation business opportunities for entering these markets. “Gen-USA” (www.gen-usa.com) is a private company providing personalised consulting and services to companies that plan to start and reinforce their international activity. Mauro has previous experience as marketing and sales specialist in the telecommunication sector and he’s an expert in business planning and internationalisation. · Planning is the first step and market analysis is always needed. · For best investment opportunities, it’s important to know where the emerging megaregions of USA are located and what’s their focus. · Being nearby suppliers and final customs is essential: in the USA there are clusters of specific industries, regrouping specialised skills and competencies, suppliers, customers, trade fairs, specialized sectoral banks and investors, schools, dedicated logistic systems, etc. · The US business climate is measured by the State Business Tax Climate Index (putting together taxation on sales, companies, people and properties and unemployment benefits), important to follow it given that it analyses which regions are better to invest in. · States are in competition to attract investments: they foresee grants, tax credits, loan, tax exemptions… depending on the number of jobs created, the activity sector, the geographical area, investments volume or innovation level. · Knowing the flows of goods and people as well as where main logistic hubs are is also very important. 1) A company entering the USA market should offer a product that differentiates on that market. 2) Speaking the same language and knowing the culture: each country has specific needs, that can be different from ours. Having local partners/employees will make it easier. In USA, business is a serious thing (much less corruption…). 3) Establishing a direct presence is the best way for having success with the USA buyers: it’s very difficult to understand that your customer wants from another country. · Economy’s changing: there’s a strong policy to differentiate economy from oil dependence. New sectors have grown incredibly and will grow more in relation with future investments. Once, Dubai was a “transition” country; now people are settling, so “family services” are growing: education, social and personal services, entertainment, restauration, retail, telecommunication, tourism. GDP per capita is very high, so services must be high-quality. · Dubai Expo 2020 is about technology: 25 million visitors are expected, all of which will be foreigners. · Dubai Smart City Project was launched in late 2013 to transform Dubai into a smart city. · ICT and technology are continuously growing, but they want to adopt unique and innovative technologies and solutions (not copies). They want to buy the whole system/service/pack, turnkey solutions (not just single parts) and they want to have the competencies on site. · There is a strong Foreign Direct Investment (FDI) attraction policy: low taxes and customs duties, as well as many free zones, where it is easier to have a company. · Business-oriented environment, no corruption, stable political system. 5) Important is having a local presence.